I've been lusting over a pair of mules ever since I tried a pair of chunky heeled cognac mules from French Connection in Saks a couple of years ago. 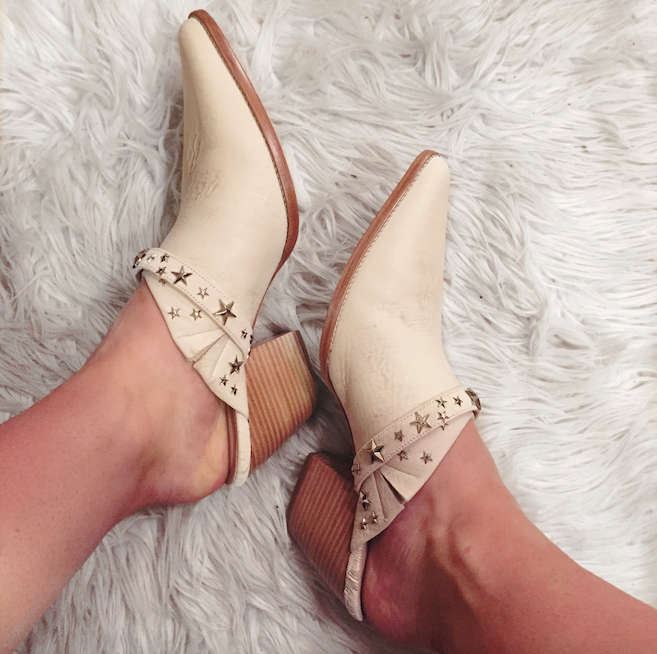 They were a size two small and I wanted to cry, but I told myself that some day I would find a pair of mules that did the trick for me. Alas, I found this pair from the Matisse and Kate Bosworth collection that I absolutely adore. But, we'll talk about those later this week. This post is all about the mule style shoe, the sort of shoe that I've seen nearly everywhere lately. I get why they're so popular. They're easy, you literally just slip your foot into them and you're done. There's no need to worry about the backs of your ankles getting ripped up or having to fret with buckles and laces and all of that nonsense that can bog you down. Nope, just slip 'em on and go. The second I tried my pair on, I immediately had to pair it with different looks in my closet to see how I would get the best wear out of them during the summer months. I mean, there are days where it's cooler and they'd be easy to style with jeans, but what about those hot hot days where it feels like my skin is going to melt off? Those were the tougher outfits, but I think I figured out some choices! Obviously, denim shorts would work just the same, but I found that this style of shoe looked really cool with lighter-washed denim that were really distressed and slightly baggier. I basically cuffed the bottom of my jeans once or twice (depending on the length) to expose a bit of my ankle (#Scandalous) and showcase the shoes more. Then, I would just pair it with whatever top was appropriate for the weather that day. It could work with a tee, a light sweater, a tank, even a button up blouse. This is for the days where it's just too hot to keep your legs constricted in denim. I know Cleveland isn't the hottest of places, but damn, there have been some scorchers lately. 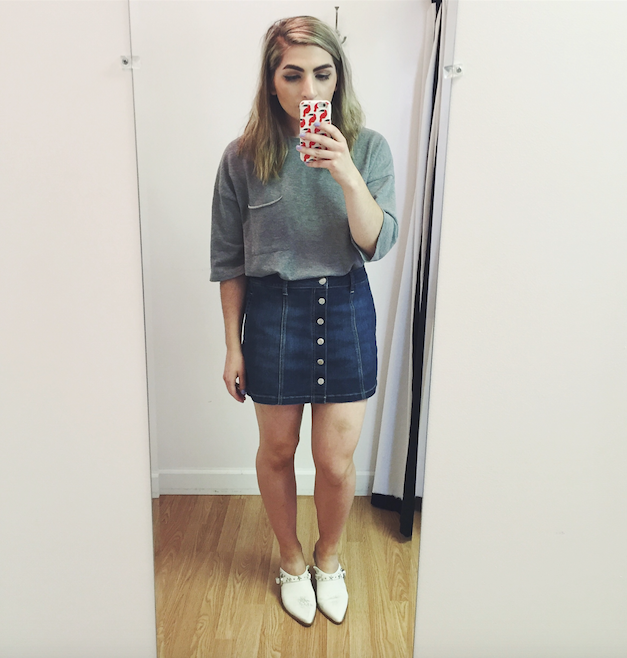 Swap out the jeans for a denim mini skirt and style it the same way that you would before! It's a really easy alternative to keep the same relaxed look while ensuring that you don't suffer from any sort of heat stroke courtesy of a pair of long pants during the summer. I wouldn't necessarily wear mules with a really girly romper or dress, but I think they look awesome with a more bohemian look. Think loose silhouettes, funky patterns, very a-la the Free People vibes. Plenty of stores sell the multi printed and flowing swing dresses that would be the perfect companion piece to whatever style mules you were looking at. There are plenty of different styles and colors of mules out on the market at various price points. You can get high-heeled mules, flat mules, somewhere in between (mine are a little shy of 3 inches). Like any trend, you can sort of pick and choose how much you want to delve into it, but I think these are a really fun shoe option for the summer, even leading into the fall time. I know I'm ridiculously excited to see how I can play around with these when the weather starts to cool down again. Do you think you'd want to rock the mule trend?